Age Spots Treatment - pHformula | Aspire & Co Ltd. The skin of the hands significantly thins as we age, along with the loss of soft tissue and muscle volume making hands appear much older. 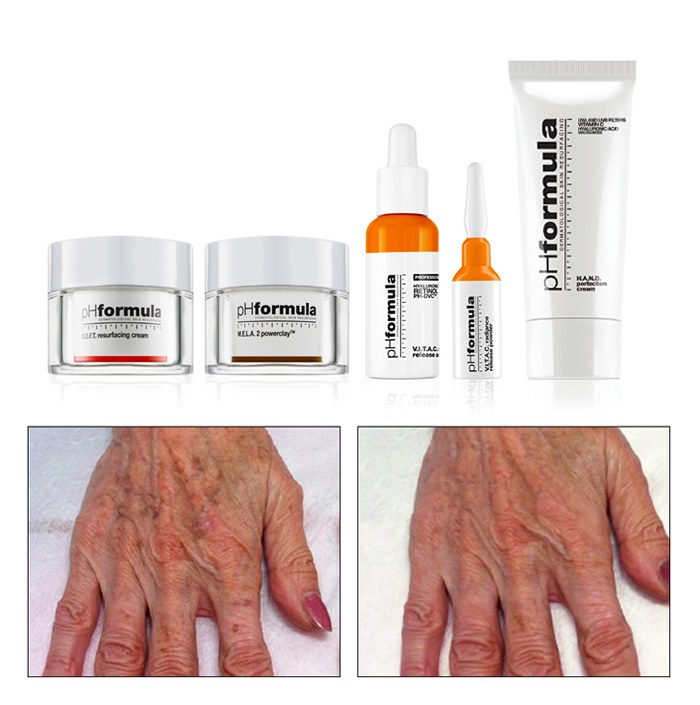 The pHformula H.A.N.D resurfacing treatment is a threefold process. The S.O.F.T. resurfacing cream is formulated with a gentle combination of Salicylic acid and Retinol to assist in superficial exfoliation and cell renewal. M.E.L.A. 2 powerclay is a powerful age spot treatment designed to reduce? the accumulation of excess melanin. The V.I.T.A. C activator triggers collagen production, offers antioxidant properties an assist in regulation of melanin formation. The H.A.N.D. perfection cream helps to prevent and visibly reduce the signs of skin ageing while providing intensive moisturising care. This formulation contains a unique combination of Vitamin C, Niacinamide and Hyaluronic acid.